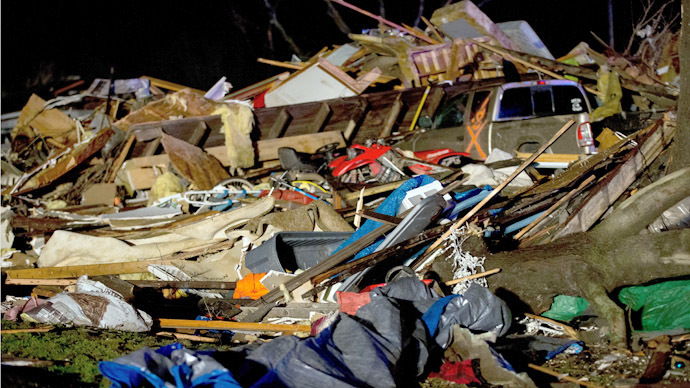 Destructive tornadoes and thunderstorms ripped through northern Illinois Thursday night, killing one person and injuring eight others in one tiny DeKalb County community where some people became homeless following the disaster. A 67-year-old woman, who has not yet been identified, was found dead in her residence, the DeKalb County coroner said. Eight people were taken to local hospitals for injuries, DeKalb County Sheriff Roger Scott said in a statement. He said that out of the approximately 75 homes in the village of about 150 residents, up to 20 were destroyed. “The west side of Fairdale was pretty well destroyed,” Scott said. A severe thunderstorm watch remains in effect for eastern Arkansas, west Tennessee and north Mississippi, the Weather Channel reported Friday. DeKalb County resident Pamela Metcalf told the Daily Chronicle that she and her husband were watching the destructive tornado unfold from the kitchen of their home. “We literally heard that train sound, and I got my three dogs into my bedroom, closed them in there, and my husband and I ran into the food pantry underneath the stairwell, and that’s where we sat and watched and waited,” Metcalf said. “The house shook like Dorothy in ‘Wizard of Oz,’ and when it got quiet we peeked out the door and there was nothing there,” she said. My thoughts and prayers are with what seems to be the entire Midwest effected by #tornado - STAY SAFE! When the tornado passed, the couple’s house was stripped of its attic and her home was destroyed. Trees, some of which could be 100 years old, were uprooted while Metcalf’s barn was leveled, as were all the other outbuildings on the property, except for a chicken coop. “[It] was an incredible mess,” Metcalf told Daily Chronicle. “Glass, debris everywhere. All the windows were blown out." Emergency crews were doing house-to-house checks to find out how residents survived the disaster. Rockford Fire Department division chief Matthew Knott told Chicago's WLS-TV earlier Thursday that "every single" structure in the town was damaged. Ogle County Sheriff Brian Van Vickle told a news conference that about 20 homes in Ogle County (adjacent to DeKalb County) were severely damaged or destroyed, but no deaths or significant injuries were reported. Twelve people were rescued after being trapped in the basement of Grubsteakers, a Rochelle restaurant that collapsed during the storm, for 90 minutes. One of those rescued, Raymond Kramer, 81, told WLS-TV that he and his wife were freed only after emergency crews managed to remove debris that had fallen over them. Trees were uprooted and power lines were down. “When the tornado hit, we all got a dust bath. Everyone in there got shattered with dust and debris falling out of the rafters," Kramer said. The State of Illinois Emergency Management Agency said it has activated its state incident response team in Fairdale, Rochelle and Kirkland. A temporary shelter has been set up for anyone displaced by the tornado at Kirkland Fire Dept., where the Red Cross and Salvation Army are on site, according to WLS-TV. The tornado was part of a storm that tracked across at least five counties, according to the Weather Service. Several damage survey teams are expected to determine the exact location and magnitude of the tornadoes. The egregious weather forced the cancellation of over 850 flights at Chicago's O'Hare International Airport and dozens of others at the city's Midway International Airport.